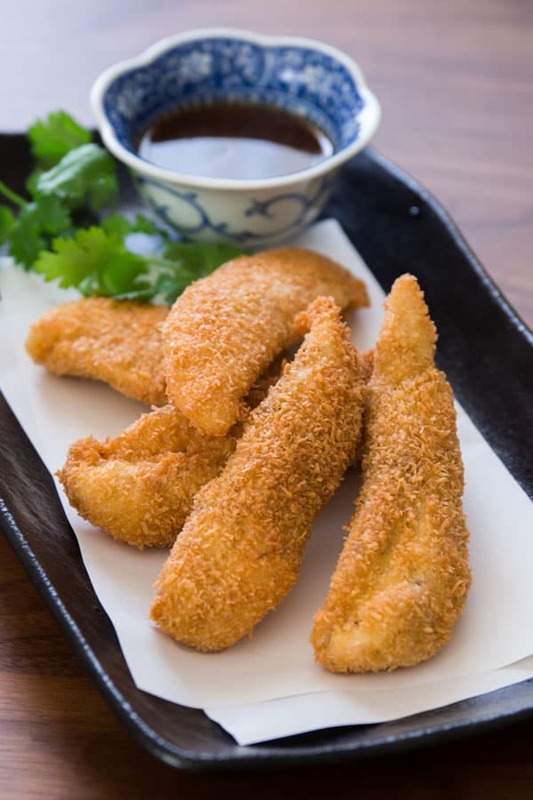 Curry flavored chicken fingers with a crisp coconut shell and mango chili dipping sauce. Easy, delicious and perfect for a party. Given how much I rant about using chicken thighs over breasts, you probably think I hate breast meat. While it’s true that chicken breasts are often overcooked and bland, when used in the right dishes and cooked properly, they can be delicious in their own way. Chicken fingers are the thin strips of white meat that are attached to the breastbone and are the most tender cut of chicken. They’re the chicken equivalent of fillet mignon; small, lean and tender, and yet short on flavor. Because they don’t have much fat, they tend to dry out easily and are best when cooked quickly over high heat. That’s why they’re perfect for breading and deep frying. Because they tend to be rather bland, it’s important to season them properly, and I can’t think of a better way to add a ton of flavor than to dust them with some curry powder. The curry not only gives the chicken a much needed boost in flavor, it also goes marvelously with the mango chili dipping sauce. I’ve made these for years using panko breadcrumbs, but lately I’ve been using dried coconut instead. It not only crisps up nicely, it bolsters the flavor of the chicken with a rich nutty taste that does a lot more for the chicken than some crumbled white bread. Biting into one of these fried chicken fingers allows you to enjoy a rainbow of tastes and textures. The piquant mango sauce, glazes the crisp curry flavored shell and gives way to the moist, juicy chicken in the center. Add the mango chutney, sweet chili sauce, and vinegar in a small bowl and stir to combine. 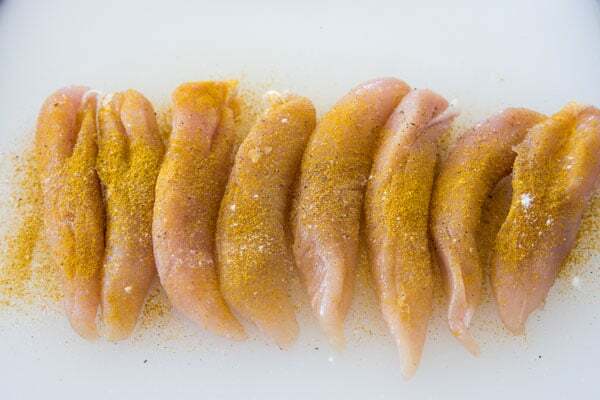 Mix the curry powder, salt and black pepper and generously sprinkle all sides of the chicken with the mixture. Get 3 small bowls and add the flour in one, the egg in another, and the coconut in the third. Whisk the egg until uniform in color. 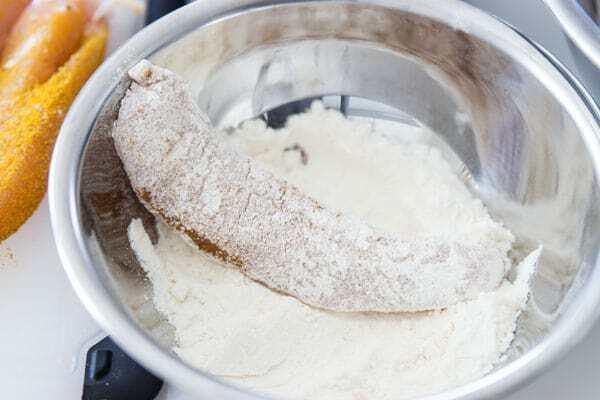 Coat the chicken in a thin, even layer of flour. Dip the chicken in the egg and coat completely. 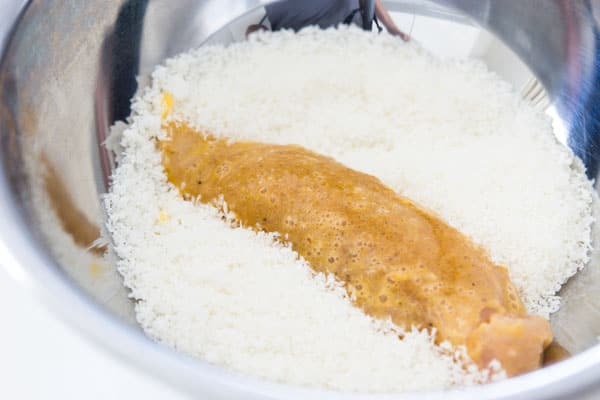 Drop the chicken in the shredded coconut and toss the chicken around to coat evenly with coconut. Repeat with the rest of the chicken tenders. Add 1.5-inches (4-centimeters) of vegetable oil to a heavy bottomed pot and heat to 340 degrees F (170 C). Prepare a paper towel lined wire rack. Fry the chicken in batches, flipping halfway through until golden brown on both sides. Drain on the paper towel lined rack and serve with the sauce. Hello! can I just pan fry the chicken strips straight away with panko instead?